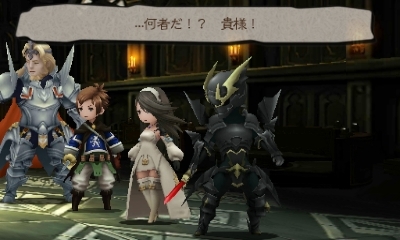 Bravely Default was one of the best RPGs to come out lately. Together with Gunvolt, it’s one of the only two games that I consider to be so good that it’s worth buying a Nintendo 3DS just to play it! Naturally, the sequel has lots of expectations to live up to, but…Hey! No pressure there! Let’s hope that it is at least as good as the first one! I love this game! I love its setting, I love its atmosphere! I love its characters! And the story…it’s also pretty good, but not as good as the one from Bravely Default, which involved a great conspiracy between opposing major figures during a war joining forces to avoid a catastrophe that was prophesized by an angel who slipped through time. Four heroes of light traveling across many dimensions to awake sacred crystals and defeat the God of Chaos. On the other hand, most of the plot in this second game revolves around the Geneolgia family and its influence in Luxendarc’s history. It’s still interesting, but not nearly as grandiose as the plot of the first installment. 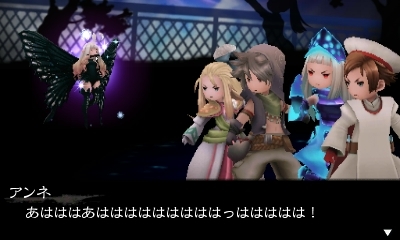 Having two returning characters in the fixed main party doesn’t do much good for the story, either, since Edea and Tiz’s character-arcs were pretty much finished. Therefore, there’s no big reveal or new development for them as they felt more like special guests. Ironically, this actually helps developing the two new protagonists more, since the story focus more on the two. As a result, their romance and character-arcs are pretty well developed. Even more than Agnes x Tiz’s. Naotaka Hayashi – famous for titles such as Robotics;Notes and Stain;Gate – leaves his post as the Scenario Writer to be substituted by 3 difference writers: Shinji Takahashi, Souki Tsukishima and Tomoya Asano (who is also the producer of both the 1st and 2nd game). The different ideas and opinions from these multiple writers resulted in some discrepancies regarding continuity and themes, as anyone would expect. Fortunately, it wasn’t as big of a mess as you usually see in a Visual Novel or Comics with multiple writers. It’s still pretty confusing, though. 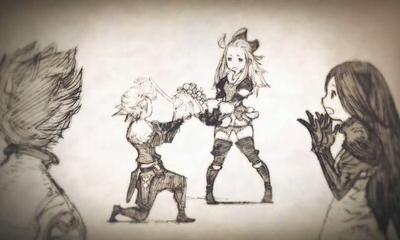 Like the fact that Edea is now in love with Ringabel, even though she flat out rejects the womanizer in the previous game (a nod to the relationship between Edge and Rydia from Final Fantasy 4?). There are also a bunch of asterisk holders who were supposed to be dead but are still alive and kicking for some reason. This all could be quickly explained if this story was revealed to take place on one of the many alternative realities seen on the previous installment, but there was no attempt to explain those things! The comical atmosphere is way more prominent than the first game. For instance, The soldiers of the Empire working at Oblivion’s side are a whole army dedicated for comical relief! They consist of a bunch of incompetent soldiers deprived of any intelligence who often poke fun of military terms and behaviors. 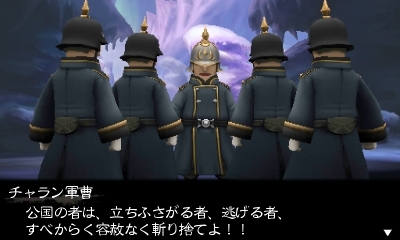 They also have an uncanny resemblance to the generic enemy soldiers from Metal Slug. 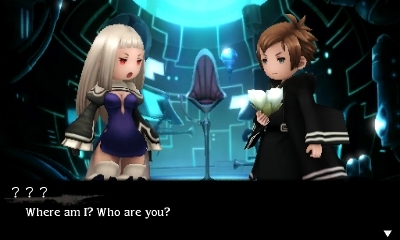 As opposed to the previous entry, Bravely Second has much more influence from popular Japanese culture and clichés, such as a whole city based on the school setting where there’s a senpai x kouhai relationship, lot’s of romance and even seven mysteries. The new asterisks also have big influecen from this by including new jobs like “The Youkai-Fox” or “The Cat-girl” (And: Yes! 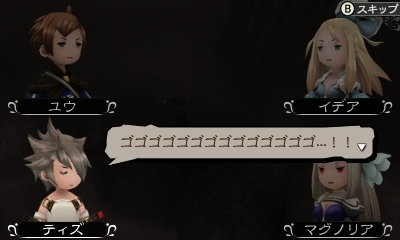 The cat-girl says “Nyah” at the end of her sentences). Additionally, the heroes will often eat ramen with hashi and there’s even an entire chapter about hot springs (onsen)! 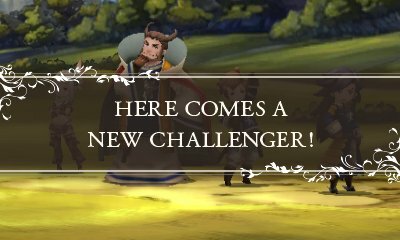 For those who played the “For the Sequel” update or the NA/PAL version there will be no new feature in the battle system aside from some useful hot-keys. Also back is the Sim City-like mode where the player has to rebuild a city and gets lots of gifts and bonuses from doing so. 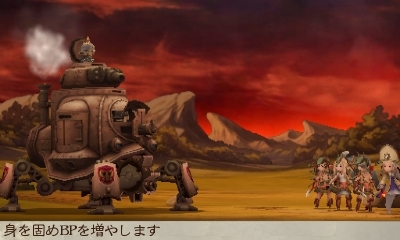 This time they need to raise the moon civilization again, (which is a pretty big step forward from fixing the little village of Norende), but since the Demon Lords (Maoh) are now officially part of the main plot, this time you have help to fight against them. This mode doesn’t include shops with weapons and armors anymore. 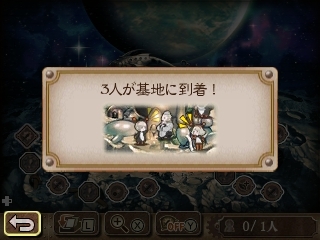 Instead, you now get to assign and enhance an army of air-ships to attack Demon Lords (Maoh) trying to invade. Those are quite helpful, but using them makes challenging those beasts way less difficult, thus it isn’t as fun. Gone are the asterisks for Spell Fencer, Salve Maker, Arcanist, Spirit Master, Vampire and Conjurer jobs, but most of the new asterisks are fancy substitutes for those, respectively: Tomahawk (sniper), Patissier, Wizard, Bishop, Cat Master (Yes! This is what they used to replace the Vampire Job: Cats!) and Youkai Fox (Kitsune). Those keep most of the same functions from the old versions, but are a bit more balanced. 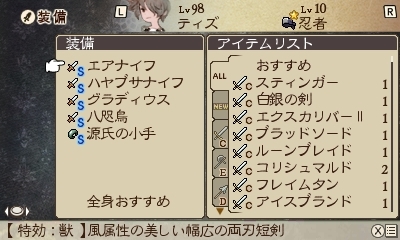 For example, the Sniper classes can’t equip drain magic to physical attacks like the Spell Fencer could, which was cut probably to avoid a cheap combo with the Black Knight class. 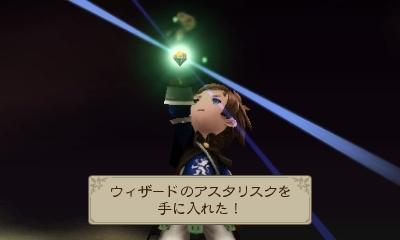 Naturally, there are many Jobs that are completely new to the series! Those are the Fencer, Astrologer, Exorcist, Guardian, Emperor, and the most broken of all jobs: The Chariot! 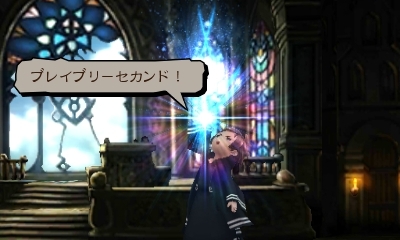 Which enables you to make what can only be described as “A glass-canon” by giving you the ability to equip weapons where you would normally be equipping armor and helmets. Thanks to that, you can make your own Roronoa Zoro or even the giraffe-lover Kaku! To acquire the old asterisks you must clear side-quests, but those get an interesting twist: You get involved in a conflict and has to choose a side. The side who wasn’t chosen will retaliate and by winning the boss battle you receive the asterisk of the person you didn’t pick. The stories are pretty interesting and have a “gray” side to it! Even villains from the first game who never redeemed themselves are not totally in the wrong during those side-stories! Most of the time you need to choose between giving a small fix to a current problem or doing a greater good in the future. There’s no good or bad choice and you always finish the side-quests on a bit of a sad note. But that’s ok, because you get the opportunity to do those again and choose the side you didn’t pick in the first time to collect all the asterisks in the game! But How? That’s easy! You also get to travel through time like in the first game. However, this time around you don’t need to repeat the same process over and over and over and over again in order to get the true ending! You need to do only a single one-way-back-trip which involves the New Game+ feature and a little “ARG”. It was significantly more fun and creative than repeating the same chapter 4 times, like in the previous game! 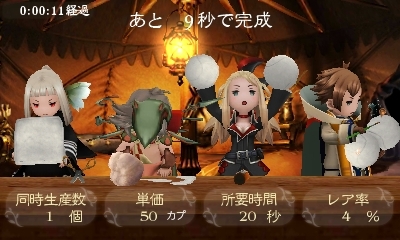 You also get a new type of skits when you sleep in tents during dungeons, which are much more fun to watch than the old party chats, because those are fully voiced and also use the actual 3D model of your party, so you can see them doing all kinds of interactions! 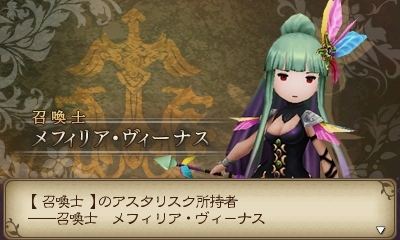 Taking Airy’s place, now it’s Agnes who is responsible to give you tips about the game. 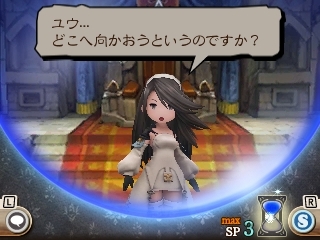 You can even use the touch screen to tease her and can use a command to ask some trivial stuff, too! Not much to say about the graphics if you already played the first game. It uses the same base and many assets are being recycled all over the place, including many of the same locations from the previous game, so it is certainly as good as before. 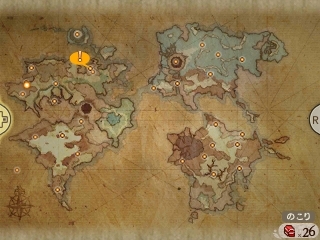 Thankfully, There are also some few new locations, expanding the already huge world of Luxendarc even more. Now the graphics are much closer to the screen during cut-scenes, so you can notice many more details in the characters, but it also means you can notice all the little flaws on the 3d models. At the beginning of every chapter, you will be granted with a beautiful opening sequence with the song Great Distance by chilly. It’s a pretty cool CGI movie, which is to be expected from SquareEnix, but I find the visual style a bit odd because everyone looks too “bishounen” and “bishoujo”, which is also to be expected from SquareEnix. I just couldn’t think of anything negative to say about the voices in this game! The entire cast is a bunch of super-stars who are famous for a good reason. They are damn good at what they are doing! …Ok! 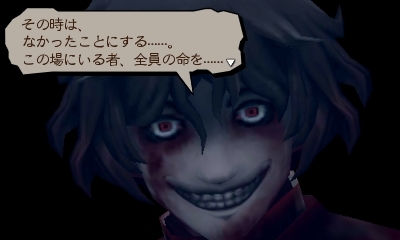 Daisuke Namikawa doesn’t sound so cool when he needs to scream furiously while playing the role of Yew. It sounds like it was quite difficult to keep Yew’s shouta voice while acting angry. Aside from that, all the rest of the voices are perfect! 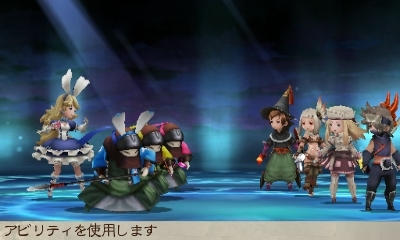 Bravely Default’s music was composed by the group Sound Horizon. It is a brilliant soundtrack that goes perfectly with the fantasy setting of the game. It was an excellent choice, since they are pretty experienced with the fantasy theme, seeing as they even call themselves a “fantasy band”. On the other hand, Ryo and his group supercell are specialized on the J-Pop genre and their pieces use a lot of electronic instruments, so there’s a big discrepancy in styles. I don’t think their compositions fit as well as the one by Sound Horizon, but it’s still pretty good! Even if their entire work sounds wrong for you, rest assured! Ryo tries to appeal to your nostalgia, so there are many tracks that sound similar to other famous Final Fantasy songs, like that super famous battle theme from FF7! Yes! The first 10 seconds of the battle song is exactly like the FF7 one! There’s also plenty of the old soundtrack being used in the game. 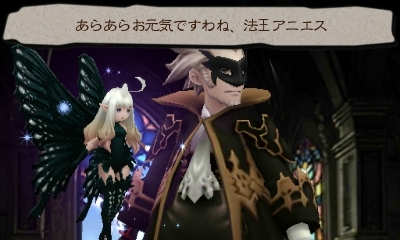 I believe every single one of the old tracks are being -reused in some form or another, which means Bravely Second got a very decent variety of songs! 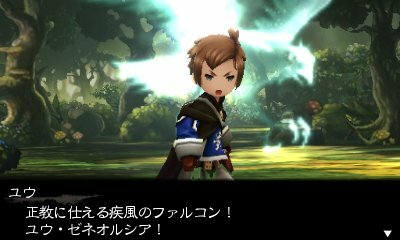 Did you know that the producer Tomoya Asano talked about his ideas for a possible Bravely Third during an interview? At this occasion, he mentioned that the next game would probably take place in a complete different universe and it would have nothing to do with the lore from the previous entries. I personally think this is the best decision, since this game proves how the world of Luxendarc is reaching its limit. As long as the story for the next game doesn’t involve something extreme that changes everything around, it will be pretty difficult to expand this story even further while keeping the game as interesting as the first one. Props to you! Just one more thing, though: DON’T LEAVE CLIFFHANGERS ALL OVER THE PLACE IF YOU DON’T INTEND TO MAKE A DIRECT SEQUEL! Yes! 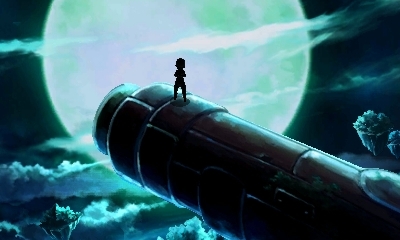 This game have a whole universe of things that goes unexplained and even a post-credits tease thingy about the “third key” and “the sword that can cut through anything”. What this means? Who knows?! We may never know! But for now, let’s just appreciate how awesome this game was! I’m very grateful to my friends who not only recommended this game to me, but also prohibited me from playing the sequel before the first one and even lend me their copy of the game with a NA 3DS. If it wasn’t for them I wouldn’t get the full experience. Yes! 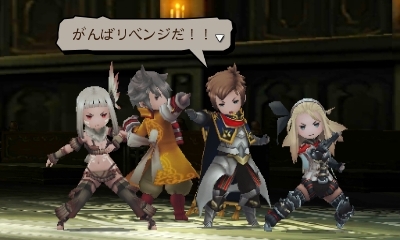 YOU ABSOLUTELY NEED TO GO THROUGH BRAVELY DEFAULT FIRST! And It was totally worth it! I love both games and I want even more people to play it and see for themselves just how great a classic fantasy RPG can be! 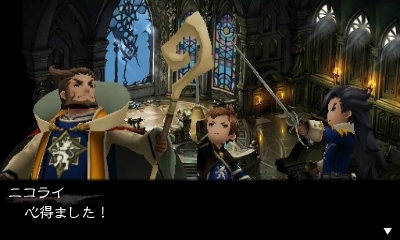 This entry was posted in Game and tagged 3DS, Game, Review, RPG, Silicon Studio, Square Enix. Bookmark the permalink. 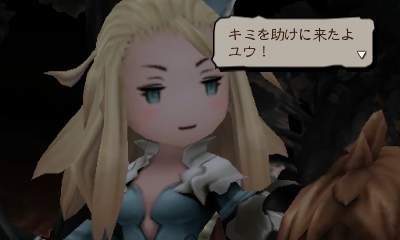 Oh gosh I’m super excited to play bravely second and I’m pretty sure it’ll be an instant buy when it get localized. 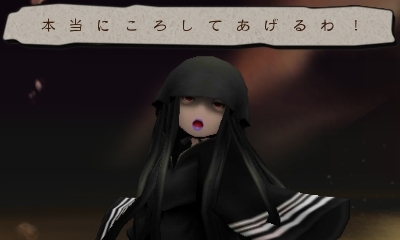 But I still haven’t finished bravely default yet. 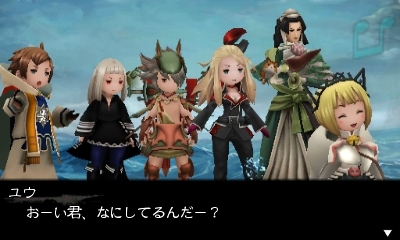 Would you say the second game is longer or around the same game play time as bravely default? That’s good to hear. I have a tendency to want to finish all optional boss fights. It’s too tempting. Did you hear anything about it being localized to North America or anything? As of now, it was only confirmed to 2016 with no specific release date.